In his final game as a Riverhead Blue Wave two years ago, Ryan Hubbard capped his career with a seven-goal performance against West Babylon. The 2014 Riverhead boys lacrosse team may be the best team in the program’s history. By the season’s end, that may not be so easily quantified. The Blue Waves may not win as many games as last year. And their postseason hopes are currently on thin ice. JOE WERKMEISTER FILE PHOTO | The Riverhead Blue Waves celebrate their second straight Division II county championship after a thrilling 21-14 win over East Islip at Stony Brook University. The season began with question marks for the Riverhead football team. The Blue Waves were down several key players and were opening the season with a sophomore at running back. After a loss in Week 2 to East Islip, it was fair to wonder just how far the Blue Waves might go this year. But quickly, things turned in the Blue Waves’ favor as Jeremiah Cheatom dominated on the ground and quarterback Cody Smith guided the team through the air. The defense began to excel and the Blue Waves kept winning and winning. It culminated with a spectacular 84-yard punt return from Ryan Hubbard to win the Division II county championship at Stony Brook against East Islip, avenging their earlier season loss. The Blue Waves fell short in the Long Island championship, losing to Carey at Hofstra University. Click here for a complete list of our 2013 top sports stories. 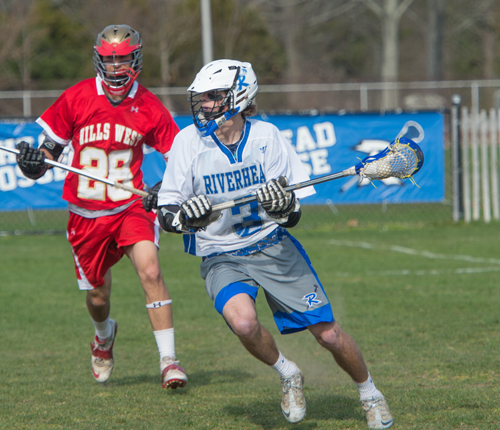 DANIEL DE MATO PHOTO | Riverhead junior Ryan Hubbard scored a career-high seven goals Friday against Deer Park. The scorebook for the Riverhead boys lacrosse team lists six ovals next to each player’s name to account for their goals scored in a game. Before the midway point of the third quarter Friday afternoon, junior Ryan Hubbard already had all six ovals penciled in. When Hubbard buried his seventh goal on an uncontested run to the Deer Park cage after a turnover, the rout was well on for the Blue Waves in a 14-1 season-opening victory. The seven goals marked a career high for Hubbard, who had six in a win over William Floyd last year. It could have been even more for him Friday, but with the game comfortably in hand, Hubbard and many of the other starters played sparingly in the second half. Hubbard added two assists as well. Senior Ryan Bitzer was the only other Blue Wave with multiple goals with three. The non-league victory was a final tune-up for the Blue Waves before they open the league season against perennial powerhouse Ward Melville at home Wednesday. It’ll be the first ever meeting between the two schools, a sign of how far Riverhead’s program has come in recent years. While the Falcons are nowhere near Ward Melville’s level, the Blue Waves came out sharp, making all the little plays that against elite teams will be essential to stay in the game. The Blue Waves hustled for ground balls, forced turnovers, won faceoffs and controlled possession. DANIEL DE MATO PHOTO | Riverhead defenseman Jaron Greenidge clears the ball against Deer Park. The lopsided win allowed Guadagnino to get everyone some action and two players got their first varsity goal: sophomore Mark Andrejack and freshman Ben Weir. Freshman Austin Fitzpatrick, who started on attack, picked up his first varsity assist. Guadagnino said he was impressed with the play of another freshman, long pole middie Blake Carrara. “He was all over the place swarming like crazy,” Guadagnino said. Guadagnino said it was a valuable experience for the younger players to get some experience before being thrown into the fire of league play. “Now they get one under their belt and we get into this brutal league schedule and let’s go,” he said. While the Blue Waves had little trouble rolling past Deer Park, Guadagnino cautioned his players there’s still plenty of area’s that need improvement. One key is fluidity on offense, he said. Riverhead had a flair for the dramatic Friday. Twice they scored a buzzer-beating goal to end a quarter. Bitzer buried a shot just as the second quarter ended that made it 8-1 Blue Waves. Weir scored his first varsity goal in the final second of the third quarter off an assist from Mark Huysman. Riverhead goalkeeper Alex Panagakos had an easy day between the pipes. He made one save and watched the second half from the sideline as John Roca closed the game out. Roca needed to make only one save as well to keep the Falcons scoreless.